The Republic of Ireland and the U.K. reached a deal in early December assuring Ireland that there would be no hard border on the island after Britain leaves the E.U., allowing Brexit negotiations to move on to phase two. Previously, president of the European Council Donald Tusk said Ireland, as an E.U. member state, would be entrusted with the final decision on whether the U.K. has made adequate progress in its Brexit negotiations to formally move forward. 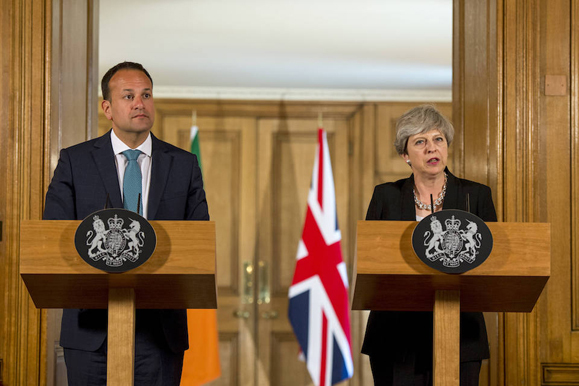 Taoiseach Leo Varadkar announced the deal in a statement, calling it “politically bullet-proof” and highlighting that the relationship between Northern Ireland, the rest of the U.K., and the Republic would remain as close as possible to the current arrangement, with the rights of E.U. citizens living in the U.K. to live, work, and study protected, and vise versa. Northern Ireland residents will still be allowed to obtain an Irish passport as well, granting them E.U. citizenship. Statement by the Taoiseach Leo Varadkar T.D. Friday 08 December 2017, Government Press Centre. Ladies and Gentlemen. A dhaoine uaisle. Today is a very significant day for everyone on the island of Ireland, for our neighbouring island, and for all of our fellow members of the European Union. Following long and intensive negotiations, we have reached a satisfactory conclusion on the issues relating to Ireland in Phase 1. As you know, Irish issues were one of three critical areas that needed to be dealt with in these talks, before the EU and the UK could proceed to Phase 2 issues such as trade and the new political and economic relationship between the UK and the EU. The other two issues, which are also important for the EU and for Ireland are Citizens Rights and the Financial Settlement. We have achieved all we set out to achieve in Phase One of these negotiations. We have the assurances and guarantees we need from the United Kingdom and support for them from the European Union. I am satisfied that sufficient progress has now been made on the Irish issues. The parameters have been set and they are good. Now, we can move on to work out the detail of what has been agreed and to talk about transition phase, free trade and the new relationship between the EU and the UK. This is not the end, but it is the end of the beginning. And we will remain fully engaged and vigilant throughout phase two, the drafting and ratification of the new treaties that will be required between the EU and UK and their implementation. 1. The Good Friday Agreement in all its parts is protected. 2. Everyone born in Northern Ireland will continue to have the right to Irish and therefore EU citizenship. So, a child born in Belfast or Derry today will have the right to study in Paris, buy property in Spain, work in Berlin or any other part of the European Union. All they have to do is exercise the right to Irish and therefore EU citizenship. 3. The Common Travel Area will continue allowing us to travel freely between Britain and Ireland. 4. British and Irish citizens will continue to have the freedom to live, work, study, access housing, healthcare, pensions and welfare in each other’s countries as though we are citizens of both. 5. The United Kingdom has committed to avoiding a hard border as an ‘over-arching requirement’ with which ‘any future arrangements must be compatible’. There will be no physical infrastructure or related checks or control. Three options have been set out as how this can be achieved. Our preferred option is a deep and comprehensive agreement between the EU and the UK in its entirety which will allow us to trade as we do now. However, that might not be possible. So there is a backstop arrangement in which Northern Ireland and perhaps all of the United Kingdom will maintain full alignment with rules of the Internal Market and Customs Union which are relevant to the avoidance of a border, north-south co-operation and the all-island economy. 6. People and businesses in Northern Ireland are being given the additional assurance that the United Kingdom government will ensure that Northern Ireland business will continue to have unfettered access to the whole of UK and that no new barriers will develop between Northern Ireland and Great Britain unless the Northern Ireland Executive and Assembly agree to it. Northern Ireland and Great Britain will not drift apart. 7. PEACE and INTERREG funding which is so valuable to our border communities will continue until 2021 and we will favourably examine continuing it beyond that. 8. The United Kingdom has committed to ensuring that in Northern Ireland there is no diminution of human rights, safeguards and equality of opportunity set out in European Law. 9. And finally, there will continue to be a distinct strand on Ireland in phase two of these negotiations. I hope to soon see the restoration of the Northern Ireland Executive and the North South Ministerial Council. The institutions will be a vital voice as we move forward together into Phase 2 of the Brexit talks. I want, in particular this morning, to recognise the concerns of the unionist community in Northern Ireland. And I want to assure you that the Irish Government has no hidden agenda. There is no question of us exploiting Brexit as a means of moving to a united Ireland without consent. We do not want to see a border in the Irish Sea, any more than we want to see a border between Newry and Dundalk or between Letterkenny and Derry. We want to build bridges, not borders. We want to free travel and free trade to continue as it does now and has done for 20 years. We want reconciliation and respect grow. Our guiding light – and our only ambition throughout – has been to ensure that the provisions of the Good Friday Agreement continue to operate in full after Brexit, and that people can go about their normal lives and business as before. In particular, the agreement we have reached explicitly recognises the provisions of the Good Friday Agreement with regard to the constitutional status of Northern Ireland and the principle of consent. This principle is the foundation stone of the new relationships we have built on this island since 1998, and will continue to build in the future. To the nationalist people in Northern Ireland, I want to assure you that we have protected your interests throughout these negotiations. Your birth right as Irish citizens, and therefore as EU citizens, will be protected. There will be no hard border on our island. You will never again be left behind by an Irish Government. These rights will, of course, be available to everyone in Northern Ireland who chooses to exercise his or her right to be an Irish citizen, regardless of their political persuasion or religious beliefs. In conclusion, I would like to thank my colleagues in Government, officials in the Department of the Taoiseach and the Department of Foreign Affairs & Trade, and especially the Tánaiste and Minister for Foreign Affairs & Trade and the Minister for European Affairs for their hard-work and commitment. The Government has been united and firm in its resolve. I would also like to thank the opposition leaders and their parties for the very practical support they have offered, both to Government and in their contacts with their sister parties across Europe. I would like to recognise the EU negotiators, led by Michel Barnier, as well as President Juncker, President Tusk, and my fellow Heads of State and Government. Their support and solidarity has been invaluable. It was beyond what we’d hoped for. It is the clearest possible illustration of the values of the European Union and why small countries are better off in a big union. It puts beyond any doubt that our future lies in the European Union at the heart of the common European home that we helped to build. Finally, to our neighbours in Britain, to the Prime Minister and her colleagues, I say thank you for your careful consideration of our concerns, your good will and good faith. I know that while Irish issues are on your agenda, they are among many challenges that Brexit poses for your country and your people. Ireland has always respected your democratic decision to leave the European Union. And we have always shared your interests – in peace, in free trade, in free movement, in prosperity – for everyone on these islands. I can assure you of the continued friendship and goodwill of the Irish Government and the Irish people in the months and years ahead. Táimid tar éis gach a raibh leagtha amach again le bhaint amach i gCéim a hAon den idirbheartaíocht a bhaint amach. Tá na dearbhuithe agus na gealltanais a bhí uainn faighte ón Ríocht Aontaithe agus tacaíocht faighte ina leith ón Aontas Eorpach. Tá dóthain dul chun cinn bainte amach. Tá na paraiméadair leagtha síos agus is cinn maithe iad. Is féidir linn gluaiseacht ar aghaidh anois chun na mionsonraithe dá bhfuil aontaithe a oibriú amach agus plé a dhéanamh ar chéim an aistrithe, ar shaorthrádáil agus ar an gcaidreamh nua idir an AE agus an Ríocht Aontaithe. I once crossed the artificial Border between the 2 parts of Ireland, accompanied by my wife, a New England Methodist who has family connections in the North. As we drove north from Dundalk, I kept a close watch for the Border because I intended to take photos at that point. However, I realized that we were in Co. Down when I noticed that a filling station has the prices shown in pounds, not euros. Almost everything at the other side of the invisible Partition looked much more Irish that British. This Border is superfluous.